ahhh love it! what a great idea!! these look beautiful! I love the idea of serving them on soup spoons! @Natalie Wish I could take credit for the idea, but alas, I found the recipe on the Internet. @flutterbyblue If you make them more softer, the soup spoons works nicely. @Graeme I love creating alcoholics! What a fun idea! It looks great. without launching into a rant about how anything mixed with anything else is called a martini these days (most people don’t even know a true martini uses gin), doesn’t a blueberry martini usually have triple sec in it, too? would throwing in triple sec make it too watery/alcoholic? is there a critical point beyond which there’s simply too much alcohol in gelatin for it to set? @juan I totally agree with you. For the longest time I couldn’t get over these cocktails that called themselves martinis when they just had vodka in them. I think a real martini needs a drop of vermouth in them to be called a martini, but then I had a drink and got over it. What a brilliant idea for a fun cocktail-party twist! They remind me of a grown-up version of the finger-Jello I ate happily as a kid. How do you get them out of the molds? @Kathy Well, they say leaving the tray in a warm water bath works, but I think the best, and quickest way is to simply scoop them out with a knife or spoon. Good luck! @alice – Yeah, I can’t wait to make some more this year. Maybe mojito shots. Let me know how yours turns out! I like how the fresh fruit and clear jello helps to add a touch of class – thanks for the great idea! @Jello Diva – If you want to get fancy, try a pretty mold. I was too lazy. I think I might try this with peach vodka and white peach cubes. @BlogDog – Let me know how it goes! Just get creative and you can make anything! By the way… The name I gave those margarita jello shots is “The Blue Agave”… I thought that was original and kind of a cute idea! I hope you all like it. I made these last night and though they looked really cool, they were soooo tough and hard compaired to normal jello shots. We threw them on the ground and they bounced… You could hardly even chew/swallow them. It was not good and I followed the recipe to a T. I will be making my normal jello shots with actual jello and not pure gelatin next time..
@Shannon – They are a bit harder because you want to be able to pick them up, but not that hard. Mine were fine using the recipe and I made them a few times. Perhaps you can add a little more water if you want to try it again next time. @Anne – It’s basically sugar water. Instructions to make simple syrup are in the recipe above (combine equal parts sugar and water in a saucepan, and stir over medium heat until the sugar is dissolved). Depending on whether the blueberries are sweet or not, you can add a little more or less. Where can you but plastic soup spoons? @lisa – In NYC, they have them at several stores in Chinatown, but they also sell them online, although not as cheap. I did a quick search and found them on Amazon and Ebay. There’s a restaurant depo store in virginia, I wonder if they have some there.. I don’t have enough time to order them online, they won’t get here in time… thank you! Good to know for future though! There’s a restaurant depo store in virginia, I just called them and I can get 1,000 for $6 that’s amazing! I don’t have time for them to get here if I buy them online, this works better because I can just go to the store. Ill post how they turn out! @lisa – Good for you! Yeah, I thought the price on Amazon was too much. Ebay is better, but if you’re in a rush, it won’t help. Good luck! This recipe was a lot of fun. I made them for my 4th of July BBQ. I made two batches one used rasperry vodka and blueberries and then bluebrry vodka with raspberries. Called them Red, White and Blue-berry shots 🙂 They were a hit! I do have one question though, even though I used the recipe above exactly as it is written, mine came out a little cloudy … It didn’t matter much since it was more of an asthetic thing and didn’t impact the taste. I still wonder what (if anything) I am doing wrong? @Ronda – What a great idea! Not sure about the cloudy part. Is it possible you were beating the liquid a lot before refrigerating? @bionicgrrrl: Thanks for the reply. I may try it again this afternoon for another 4th of July activity we are going to. My assitant (husband) has a tendancy to be a little over zealous when he stirs things. Cloudy or not – there wasn’t one left at the end of the night. @Ronda – I wonder if it had to do with the simple syrup. Perhaps it was hot when you combined it with the vodka? Not sure. Glad you liked it! blueberry vodka is a great touch. I’m thinking it’s not an issue because no one else has brought it up, but if you’re heating the vodka, doesn’t it lose the alcohol? You could add the alcohol to the mix after you dissolve the gelatin, and stir it in well. That way you wouldn’t cook off any of that precious liquor! We made these for a Christmas party. They were the hit of the party. They also taste amazing! Thanks for a wonderful recipe. We did the warm bath method and a butter knife to get them out of the ice cube holders…it worked great. Only a few mishaps, but HEY, you get to taste the rewards while preparing the platter. @Bex & saruchan28 – If any alcohol evaporates, it’s pretty negligible. The end result is very boozy! @Rachel & Will – So glad it worked out! I didn’t think I would ever again find myself planning the ingredients for Jello Shots. This must be why we never say never. I am just launching a new company making restaurant apps and text marketing services. Most of my staff is running a decade behind and this is perfect for our then and now fusion theme Thank YOU!! We tried these jello shots last night because, frankly, they look adorable. To be honest, they were probably the worst jello shots I’d ever had. I made them exactly according to directions. 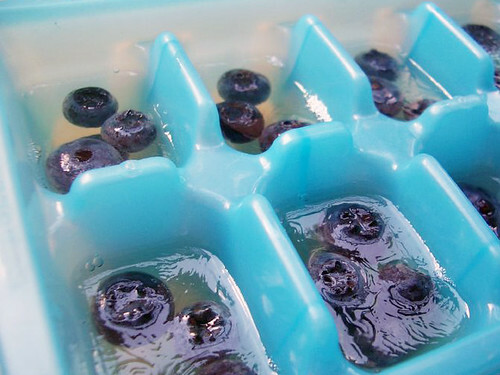 They tasted overbearingly of alcohol, and were a trial to get out of the ice cube trays. Remembering them now makes me wince. I think this could be a keeper with a bit of adjusting to the recipe, but as is, they were awful. Great write-up, the picture of finished product looks unreal (in a good way). I would like to keep a tray of these in my freezer for whenever I have friends over but I wouldn’t want the berries to go bad, what’s the longest you think I can keep them frozen for? Days, weeks, months? @Dave Y – Good luck! @Suep – These shots are strong. If you don’t like the taste of alcohol, I would definitely up the simple syrup and reduce the alcohol. @M – Freezing jello can get iffy (e.g., ice shards, freezer odors). I wouldn’t try freezing, but if you want to give it a try, let me know how it goes. Berries usually keep in the freezer for about a year though. Could you not just use less gelatin if you want it more like jello and less like rubber? @Zeno – I wouldn’t call them like rubber, but if you prefer softer jello, definitely add less gelatin. However, these are meant to be picked up, so if you make them softer, I’d suggest spoons like in the pic above or shot glasses. Awesome recipe. I made it a few nights ago, only though part was removing the gelatin from the molds, I guess that’s why silicon is better than plastic! I know it says equal parts of sugar and water for the simple syrup but how much sugar do you use?